The Intermix Crossbody Bag by Mona B. sports a neutral stone canvas exterior with brown leather accents. This compact bag is packed with features that add to its practicality and chic style. A foldover strap with a magnetic closure is highlighted by leather accents and a decorative vintage-look buckle. The front compartment has magnetic closure, and has cotton lining and an open pocket. The center compartment has a double magnetic closure for security, cotton lining, and contains a built-in wallet with 6 credit card slots, a windowed ID slot, and 4 slip pockets for cash, tickets, phone, etc. The main compartment at the top of the bag has zipper closure, a surprisingly roomy interior with cotton lining, and a zipped pocket. 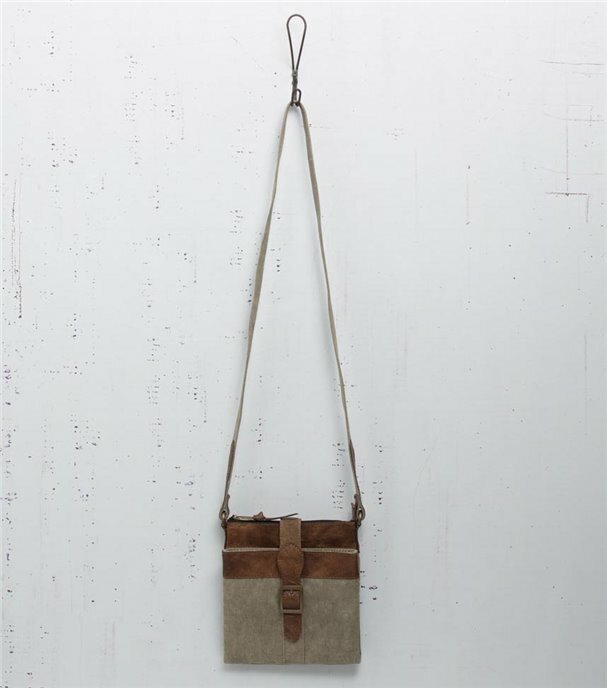 The crossbody strap has a 22" drop, and the bag measures 8"H x 7.5”W x 2"D. Made from recycled antique military tents and tarps. The fabric shows the history of its travels. Color variations and patches add to the uniqueness of each bag. Heavy cotton canvas trimmed with leather.